Mark this date on the calendar people! For the first time I'm actually posting the Daring Cooks recipe on time! Third time lucky as they say. Besides marking the calendar though, you should definitely bookmark this recipe. The January 2010 DC challenge was hosted by Cuppy of Cuppylicious and she chose a delicious Thai-inspired recipe for Pork Satay from the book 1000 Recipes by Martha Day. I haven't had satay before (gasp, shock, etc); it was one of those things I'd been meaning to try but never got around to - you know how it goes. Take it from me: if you haven't tried satay before, put everything down, gather the ingredients and get your marinade going right now.That is an order. From the Yum Police! Okay that was cheesy, but I promise you'll forgive me after you've tasted the peanut-y creamy goodness that is satay sauce. Honestly, I considered drinking this stuff straight, so awesome was it. Now what are you still waiting for? 1. For the marinade - puree the onion, garlic, ginger, spices, lemon juice and oil until smooth in a food processor. 3. Remove chicken from marinade (but don't scrape the marinade off). Thread each strip onto a skewer and place under the grill for about 15 minutes, turning once to ensure even browning. 4. Meanwhile, make the peanut sauce, by combining everything in a bowl and gently microwaving it to melt the peanut butter and thicken the sauce. 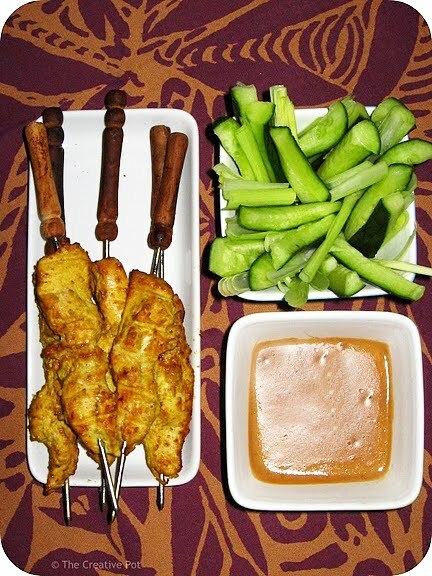 Serve chicken skewers with the peanut sauce to dip. yay for satay! it's about time i make some again. WOWOWOW lovely work on this challenge yes the recipe is quick easy and so yummy!!!! Lovely picture. Cheers from Audax in Sydney Australia. The Yum police are very happy with you - looks really delish. I think I might treat my boys for this for Sunday supper instead of the usual toast and eggs! Thanks for all the lovely comments guys, I really enjoyed making (and eating!) this dish. For sure one to add to the regular rotation. Mmmmmm, satay skewers! These are some of my favourites - and who doesn't like food served on a stick? ?